It was mid-November and Tioga Rd had been reopened following a few minor storms. It had been a week since the last precipitation so I figured the snow had time to settle and maybe I could get some snowshoeing in. There is an unnamed peak on the Sierra Crest between Mt. Dana and Mt. Gibbs in Yosemite that I had hoped to climb during the Sierra Challenge this past summer, but that didn't pan out. So I made it my first target at start of a three-day road trip. I had spent the night parked near Crane Flat in the Tuolumne Grove parking lot. Just past there is a sign indicating no overnight parking beyond it on SR120, and as it was already well past midnight, I didn't feel like driving more than an hour to get on the other side of Tioga Pass. I was happy to find my sleep undisturbed by park rangers or other troublemakers during the night. In the morning I was up around 6:30a and soon driving east towards Tioga Pass. I breakfasted while I drove, arriving at the Mono Pass TH before 7:45a. I was soon off on the trail which I found almost completely dry and fairly frozen, snowshoes and crampons in the daypack, poles in hand. I hiked less than half a mile of the Mono Pass Trail before cutting left to follow the Dana Fork upstream, forming the canyon between Mts. Dana and Gibbs and leading directly to the unnamed Peak 12,565ft. I passed by an old mining cabin lower down and found occasional blazes on trees marking an old trail, though little of it remains. The cross-country travel here is fairly easy with only minor brush encountered in the middle of the route. I found much snow on the south side of the creek and almost none on the north side which I favored on the way up. I kept the snowshoes in the pack and enjoyed the several hours it took me to ascend the drainage. Trees and brush give way to rock and talus in the upper section, though nothing I would characterize as tedious - good footing for the most part. I found two summits to Peak 12,565ft and first visited the lower south one that has a pretty awesome view looking south to Bloody Canyon with Mt. Lewis rising high on the opposite side. There are also fine views of Mts. Gibbs and Dana as well as Mono Lake to the east, though the other summit offers these other views as well. I made the short traverse to the north summit, arriving at the highpoint by 10:20a. I found no register, but took a few more photos of the wintry scenes before starting back down. 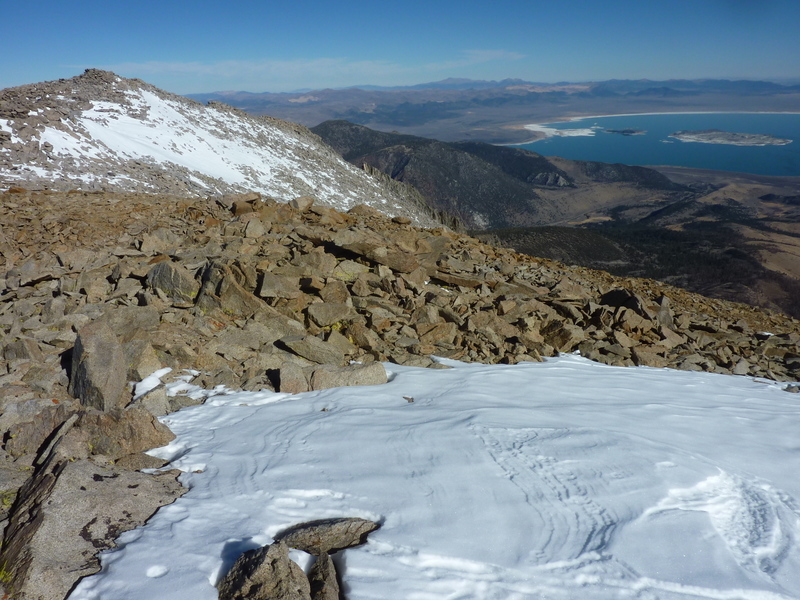 Once off the mostly snow-free summit rocks above the saddles, I decided to descend the south side of the drainage so that I could make use of the snowshoes I'd carried with me. This occupied me for more than an hour before I finally ran out of continuous snow to use them on. I put the snowshoes back in the pack, moved to the north side of the creek and finished my descent back to the trail below. Not long after noon I had returned to the car, finishing a 3,000ft, 8mi effort. Not quite done, I headed out of the park over Tioga Pass (surprised but happy to see the entrance station unmanned and closed for the season) and down the road a few miles, stopping near the Warren Fork for a second hike. This was a shorter effort, 2,400ft and about 4mi roundtrip to unnamed Peak 11,282ft overlooking Tioga Canyon and a few miles south of Mt. Warren. My ascent route followed the first drainage up, leaving the trail that plies the Warren Fork almost at the start. The route is quite steep but it appears a use path has been forged through the medium-duty brush that grows on the slope. I followed this up until the brush ends at a talus slope (which appears to be an awful climb if one were to continue directly up), then followed the boundary of the brush and talus to reach a more manageable drainage. Where forest cover offered surer footing, I left the drainage to climb to the summit up the west and northwest slopes. There was more snow here than I had guessed, and having left the snowshoes behind this time, I had to make the best of it. I was happy to be able to avoid most of the snow, and what white stuff I had to plow through only got my boots moderately wet - my socks seemed to stay quite dry. It was after 2p when I reached the summit, having taken about an hour and a half. I found a small plastic medicine bottle holding an Andy Smatko register which didn't surprise me any - I had found others in this area on previous trips to nearby Mt. Warren and Lee Vining Peak. Andy left the register on his second ascent, pointing out that he had made the first ascent some years earlier. Never mind that miners had probably trampled all over these peaks 150yr ago. It was quite sunny and almost warm at the top, overlooking Tioga Canyon with Mt. Dana rising impressively to the south. I had hoped to continue to Mono Dome further east, but the GPSr told me it was more than 2mi away and the sun told me I'd get back well after sunset. It gets cold quickly after the sun goes down at this time of year so I decided to turn back. My descent route was a very poor choice in hindsight. I descended north towards Mt. Warren thinking the gradient would be easier, but it turned out to have lots of snow I couldn't avoid and the boots got wetter. I also chose a different route down to the Warren Fork which turned out to be steep, loose talus and not really any fun despite the fine view of Tioga Peak to the west while descending. Once back on the trail near the creek, things got much easier and I found my way back to the van before 4p.